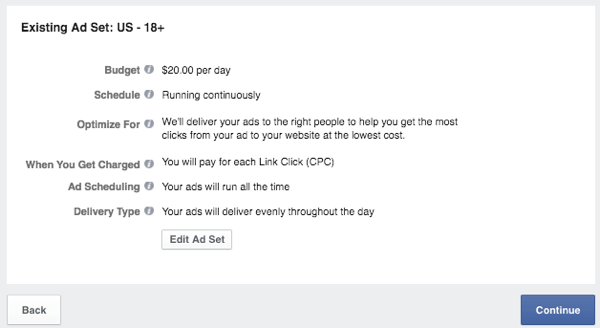 Do you use Facebook’s Ads Manager to create ads? Have you noticed the recent changes? 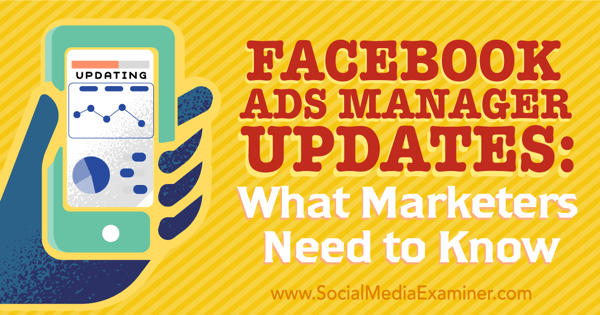 In this article, you’ll discover how to navigate the updated Facebook Ads Manager and leverage its new features. 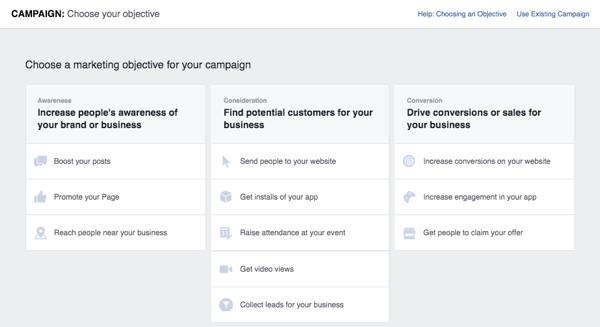 Discover new updates to Facebook Ads Manager and what marketers need to know to leverage its features. When you first go to your Ad Accounts page, you’ll see a list of your ad accounts. If you use Business Manager and also have ad accounts outside of it, you’ll see a link for both types of accounts. Your accounts are listed on your Ad Accounts page. One interesting part about Ads Manager is that even if you’re not using Business Manager, you’ll receive notifications for only your Facebook pages while inside Ads Manager. These are referred to as Business Notifications. The new layout can help you stay focused. This will help keep you focused on your work instead of being interrupted by personal notifications from your profile. 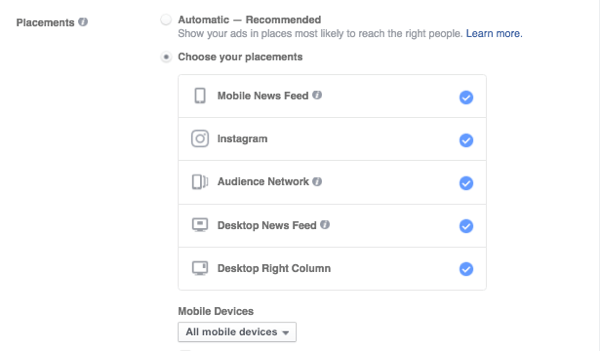 When you click through to a specific ad account, you’ll get an overview of the insights from your latest Facebook ad campaigns. 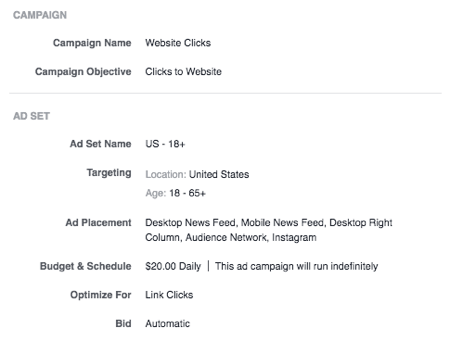 You can click on a specific campaign to see more detailed insights for it or toggle campaigns on and off. Gain valuable insights for each account. You can use the three buttons on the right side of the table header to add or remove columns of data, break down data, and export data. You can expand, export, and even break down data. Use the three buttons at the top right of the screen to search, filter, or change the date range to view specific campaigns. View data and date ranges for specific campaigns. The button to the left of your account name has options to save the view as a report that can be emailed to you regularly, as well as monitor your ad campaign performance. Save views and have them automatically emailed to you. When you’re ready to access other areas of your Ads Manager, click on the three lines next to Ads Manager, and if applicable, hover over All Tools. This will display all of your Ads Manager features. Hover your mouse over each tool to learn more about how it works. Note: Some of these options may not be available if you’re not a Business Manager user. 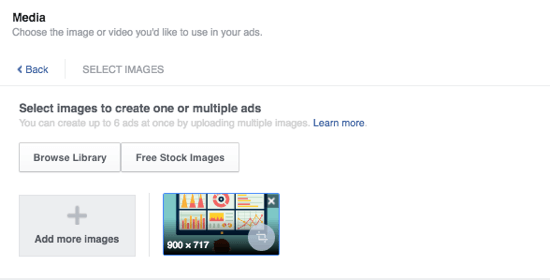 If it’s been some time since you’ve been in Facebook Ads Manager and you’re interested in running remarketing/retargeting ads (ads to people who have visited your website), click on the Pixels link under Assets in the Ads Manager menu. If you see the image below, click Create a Pixel to start using the new Facebook pixel. Setting up the new Facebook pixel. You can learn more about how it tracks your conversions here. But basically, after you click the button, give your pixel a name. 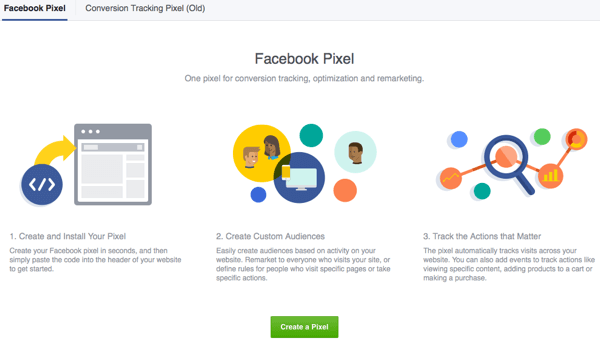 The pixel tracks your conversions. You’re given the option to install the code yourself or email it to someone else who can install it on your website for you. You can install the code instantly or email it to another person who can install it later. Once installed and activated, you should see a green light, and eventually some traffic gathering through your pixel code. A green light means the pixel is working correctly. 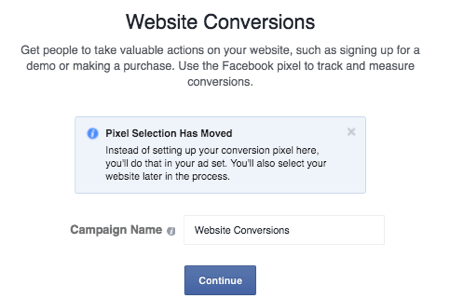 You can then click the Create Conversion button to configure Facebook to recognize when specific conversions happen on your website. 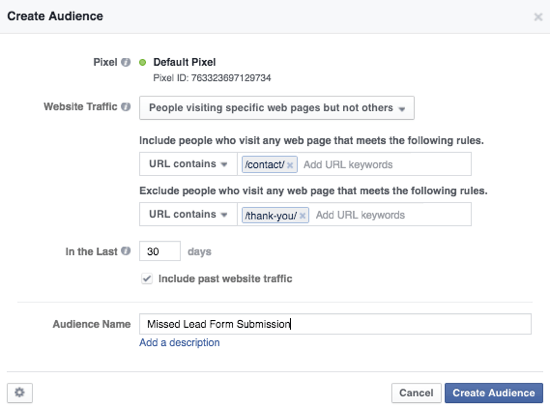 For example, when someone submits a lead form, you can tell Facebook that the lead conversion happens when a visitor lands on the thank-you page for your lead form. 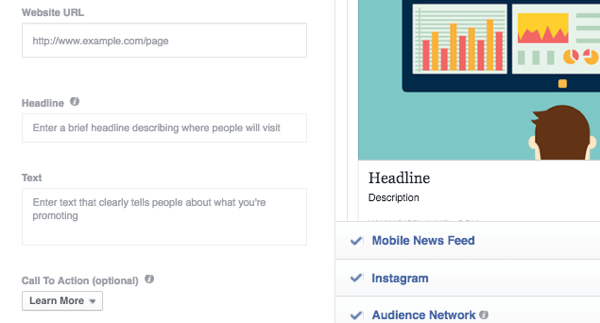 The Facebook pixel can be customized with triggers to let you know about specific conversions. You can also create custom audiences for your remarketing/retargeting ads based on whether someone has visited any page, a specific page, or one page but not another on your website. For example, did people go to your lead form page, but not to your thank-you page to complete the lead conversion? You might want to advertise to them and try to get that conversion. Audiences can vary in the types of actions they take. The same could apply to a retailer whose visitors may have viewed a product or put it in their shopping cart, but didn’t purchase it. Or visitors to a squeeze page who didn’t convert into subscribers. Speaking of custom audiences, if you click on the Audiences link under Assets in the Ads Manager menu, you may find that you have a new option besides the traditional Customer List, Website Traffic, and App Activity. 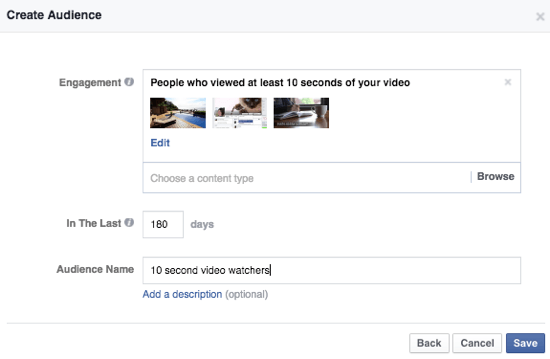 Choose the new Engagement on Facebook option to create custom audiences based on how long people have engaged with video content you posted to your Facebook page. You can measure audiences based on the amount of time they spend with your live or recorded videos. Once you choose the length or percentage of engagement, you can choose one or more videos. These include live or recorded videos. Live or recorded videos should now display. Then you can name your audience and save it. Add a description to your audience name. 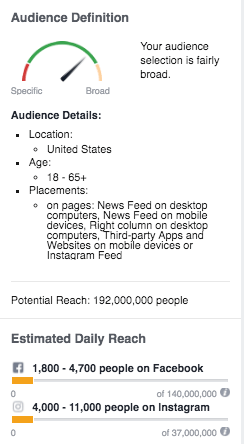 Like any other custom audience, your new custom audience must reach at least 20 people to be used for ad targeting. When you’re ready to create an ad, click the green Create an Ad button throughout Ads Manager. Here, you might notice a few changes. For starters, you can hover over each marketing objective to learn more about it. Hover your mouse over each campaign type to learn more about it. You can click on the link near the top right to create an ad for an existing ad campaign. This is useful if you want to create multiple ad variations for A/B testing in a particular ad campaign, or if you want to use a different image for each ad placement in the same ad campaign. You might also find that for certain objectives, the ad creation process has changed. For example, if you choose to send people to your website or increase conversions on your website, you’ll choose your website and your conversion pixel later in the process. Now choosing your website and conversion pixel happens later in the process. 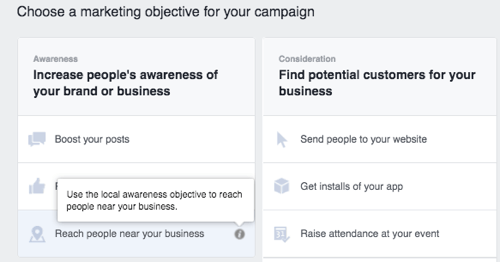 If you’re starting a new ad campaign, choose your marketing objective and give it a name. When you click Continue, you’ll define your ad audience. Define whom you want to see your ads. The audience targeting is still pretty standard. You can click the drop-down list next to New Audiences if you have saved audiences (audiences that you’ve defined previously). 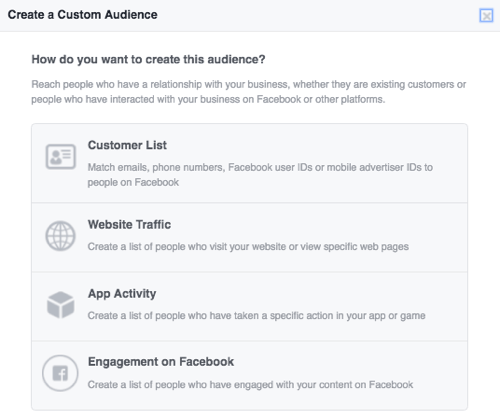 Choose a new audience or select from your saved audiences. You can select custom audiences to include or exclude. You can choose to include or exclude custom audiences. You can specify where people live or when they visit a specific location. Locations help you pinpoint where your audience is physically. 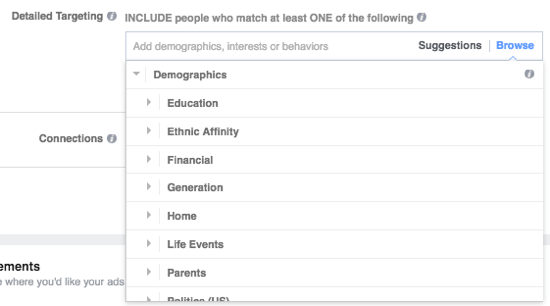 And you can choose from hundreds of different demographics, interests, and behaviors. From here, you can apply further audience demographics. All the while, you can monitor your bar to see if your audience is too broad or too specific for your needs. Too broad or too specific, the Audience Definition Bar provides a quick assessment. Next, you’ll choose your placements. Note: You can still select or deselect specific placements later in the process when designing your ad creatives. 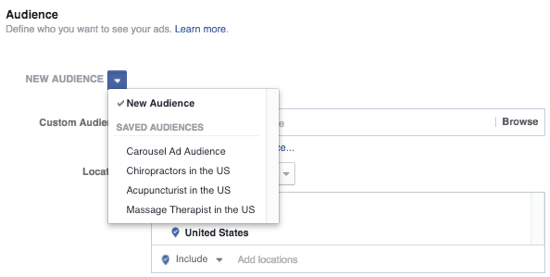 Define where you would like your ads to appear. At this point, configure your budget and schedule, and name your ad set if you plan to reuse it in the future. Giving your ad set a name makes it available to use again. From here, you’ll design your ad, starting with your media. Select media, text, and links to create one or multiple ads. Enter the basic website URL, headline, description, and call to action. Enter text that clearly tells people what you’re promoting. 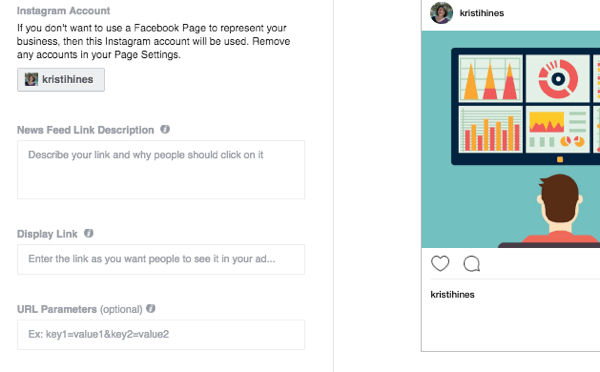 This step is followed by the Advanced Options, which you use to configure your your Instagram account, news feed description, display link, conversion pixel, and sponsor (if you have a verified page and are promoting branded content). Advanced Options help you configure your connected Instagram account. Once you’re finished, review your order to see your overall settings and then submit it for review. Check all of your ad settings before submitting it for review. Once your ad is approved, you have the option to create a similar ad. Once approved, creating a similar ad is easy. The similar ad will fall under the same ad campaign and ad set, allowing you to test different headlines, descriptions, images, and so on. Test different headlines, images, and descriptions. Or you can continue to your Ads Manager dashboard and review the progress of your campaigns and ads. You can also create similar ads from your dashboard by clicking down to your ad and selecting the Create Similar Ad option. Your dashboard also allows you to create similar ads. 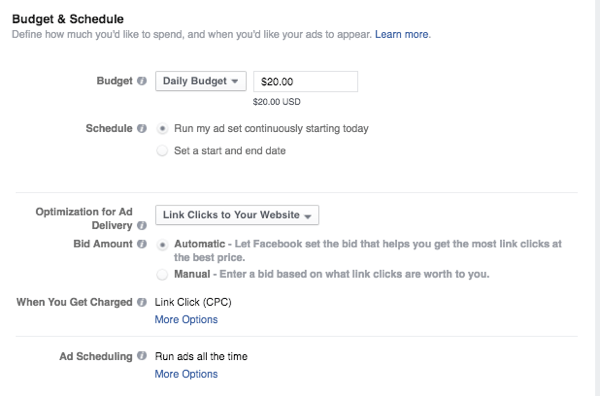 Should you choose to create multiple ads for your campaign, be sure to monitor ad performance so you can focus your budget on the ones that perform best, and drill down to each ad’s insights. Monitor each ad for performance. 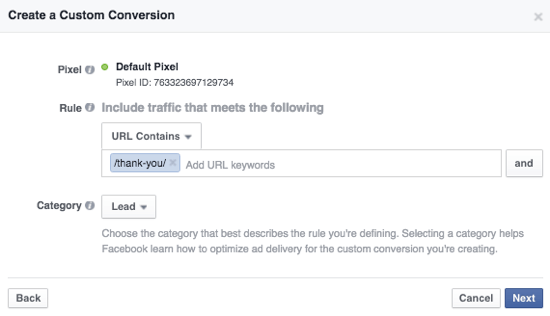 This is where having the pixel conversion tracking code is essential, as you’ll be able to see within Facebook which ad is actually driving conversions. 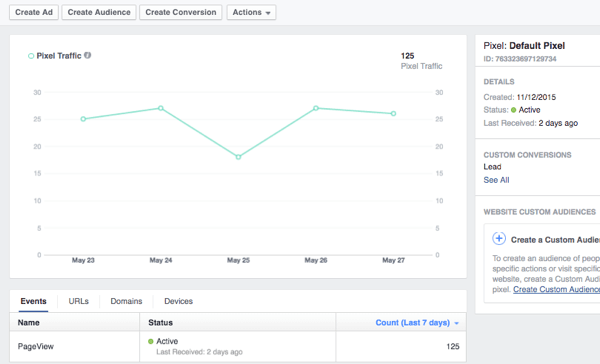 View ad performance and conversions from within Facebook. If you have a lot of ads with the same photo, it may help to click on them to see which ad text specifically is or isn’t working. Ads with the same picture can be analyzed by which ad text performs better. Note: You can click on your Instagram or Facebook post after it has stopped running to see how it performed down the road in terms of likes and comments. To do this, click the See Post and See Instagram Post links under each ad. For example, this is an ad that ran last year. While there weren’t any useful comments, it was good to know there were so many likes. 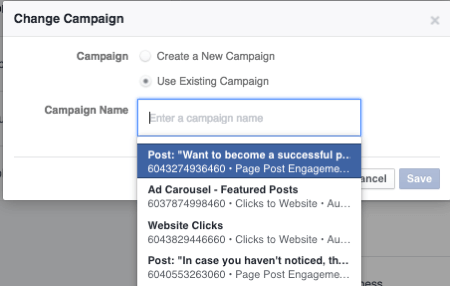 When your campaign finishes, you can always go to the Instagram post or Facebook ad itself. While it might take a while to get used to Facebook changes, sometimes those changes can be for the better, as they lead to new updates and features. Hopefully, you’ll get used to the new Ads Manager and find things like custom audiences built on video engagement helpful in your ad campaigns! What do you think? 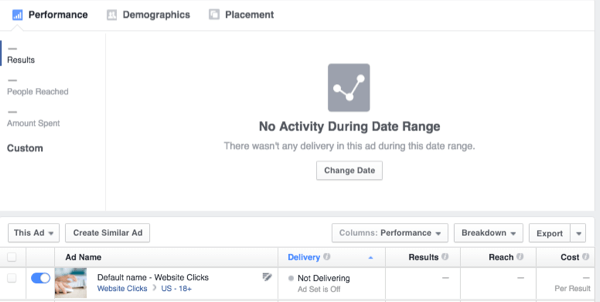 Are you using the new Ads Manager in Facebook? Let us know what you think of its latest layout and features in the comments below! 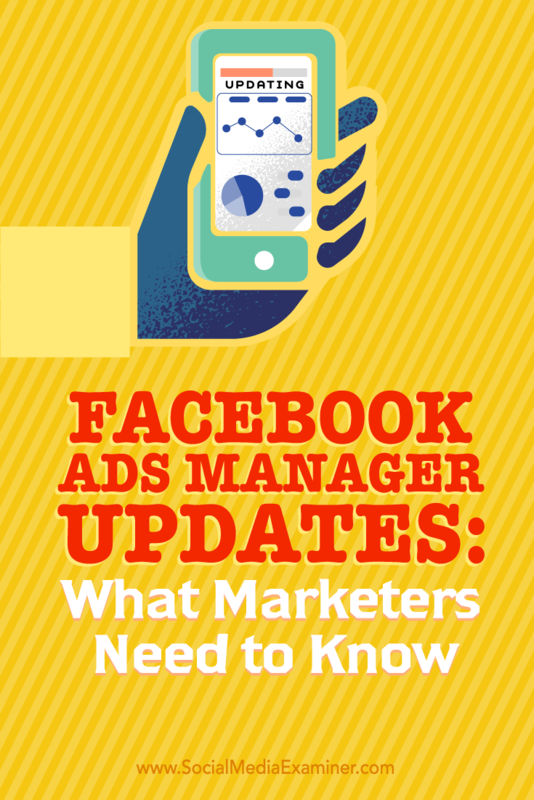 Tips on what marketers need to know about leveraging the new updates to Facebook Ads Manager.